Marrakesh. Sultry. Sublime. Souks. And, seemingly everywhere. 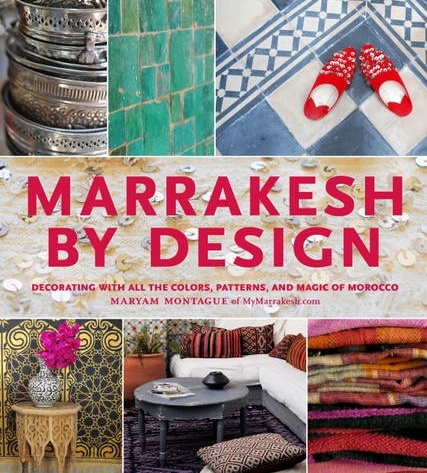 From the latest cover of LONNY magazine to the pages of Elle Decor, you can find Maryam Montague, the award-winning author of “My Marrakesh” blog and now Marrakesh By Design. 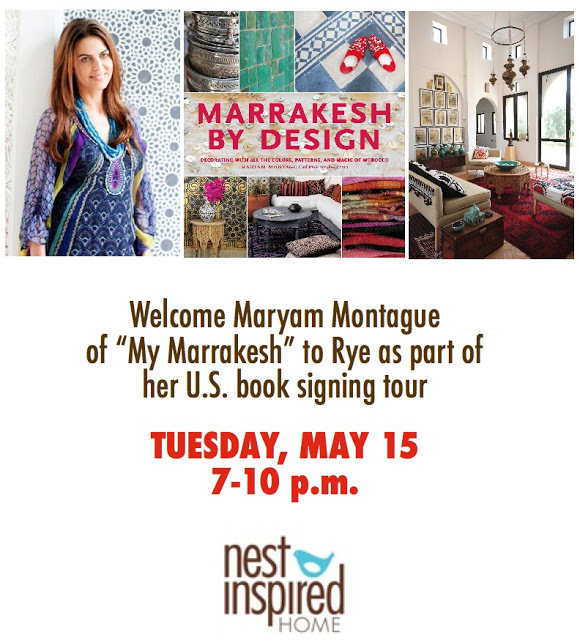 Maryam will even be stopping by my town on her whirlwind book tour through the U.S.
Stop by the party at Nest Inspired Home next Tuesday for Moroccan fare, a specialty cocktail, an opportunity to shop Marrakesh styles and meet Maryam. For those who can’t make the event don’t fret. Maryam has agreed to sign her new book for one of you!! Just leave a comment by Sunday night and I’ll pick one winner at random. Soak up the sun this weekend in your own little souk! Count me in please! Looks fabulous….wishing you a happy Mothers day Elizabeth. Looks fabulous! After the rainy week we've had we could use a little sunshine! oh, my, elizabeth. I don't always enter give-aways, but this one, I just have to. I'd love that book. my son is going to spain and morocco soon and I am so jealous. I am weak for all things marrakesh right now and I have my fingers crossed. thanks for the chance. The book looks amazing!! What a great giveaway. Happy Mother's Day to you. I love Maryam's blog and would love to have her book. So wish I could pop over for the evening! Have fun! Of course I would love to win this fabulous book! I can't wat to see you, the store and Maryam, of course! This book looks fabulous and it seems like Morocco is hotter than ever. Happy Mother's Day, Elizabeth! What a great giveaway – books are my favorite.. You can keep on collecting.. I can always find a spot for another book! I love beautiful books and wish she was coming to New Orleans!!! So sad I can't make the event but I would love a copy of Maryam's book!! Wishing you a wonderful Mother's Day!! Oh me, me, me, me, me!! I can't wait to get my hands on her book, whether I win or not!! I need a little for SPICE in my life. Would love the book. Hi Elizabeth! Happy Mother's day! Lucky you in Rye, I would love to hear her speak. I just pinned a Marrakesh style entry hall by David Easton. It took my breath away. Happy Mother's Day Elizabeth! I would love to win this book! Looks awesome! Wow what a treat! I have been a fan of Maryam for years. Beautiful work, and her spread in Lonny was fabulous! Happy Mother's Day, Elizabeth. count me in… beautiful book! have a blessed weekend!! oh i did not even know of this book, how fabulous!! what a fascinating evening you will have elizabeth, have to check her tour schedule and see if she is coming to chicago. went to morocco once, what a vast land of color, wild customs, biblical, dangerous and utterly spell binding. if not a winner, will have to go and buy this book! I would LOVE a copy of this delightful book! Happy Mother's Day! How exciting ! Love love love your blog and read it DAILY. Nope, don't pick Sue, pick me instead! (: She is a good friend so I dare to tease her! I hope you had a wonderful weekend. And that you, pretty Mama, was spoiled royally by your two boys! P. S Almost 10 pm but still Mother's day in Seattle! I love the Moroccan theme!